This is your kitchen which will cook food (6 items at a time) for you. 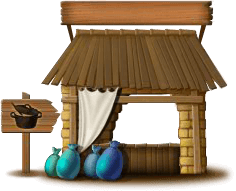 Materials for the recipes can be found in the mines both repeatable and regular mines and can also be sent for by caravan. Event cooking can be found at the end of the pages. You will need to unlock the recipes as you reach areas and/or regions that unlock and use those recipes. You will need to purchase pots to cook your recipes in. There are 6 pots available to purchase and you only have to buy them the one time. Certain levels and/or regions are required to purchase the pots. In simple words, this could be explained as "how many times the pillar is better than food" or "how many times more experience do the pillars provide than the food". In general, the higher the ratio, the better the pillars are over cooking the listed dish. Please note the pillar : food ratio isn't simply an indication you should get the pillar instead, but that you can use this ratio to compare the different foods to see which is more efficient to cook. Below 1 (adv: Food) - food provides X times more experience than using the same ingredients to make the pillars for such items. The only instance of this is Olive Bread, a dish in Greece. Exactly 1 (same exp.) - food provides exactly the same number of experience in energy as the pillar. The closest example is the Olive Bread. Above 1 (adv: Pillars) - pillars provide X times more experience than the food. For example, Bowl of Rice (2.55) provides 2.55 times less experience than making pillars; Kung Pao Chicken (4.19) provides about 4x less experience than making pillars (or, stated the other way, pillars are 4x better than cooking the items).